↑ Glasser, Ira (2003). "Branch Rickey and Jackie Robinson: precursors of the civil rights movement". World & I. 18 (3): 257–273. Retrieved September 14, 2009. ↑ Hill, Justice B. (April 15, 2008). "One meeting, two men, a changed world". MLB.com. Archived from the original on April 15, 2008. Retrieved January 5, 2018. ↑ Rampersad, Arnold. "In Pharaoh's Land: Cairo, Georgia 1919–1920". The New York Times. Retrieved February 1, 2015. ↑ "Biography". 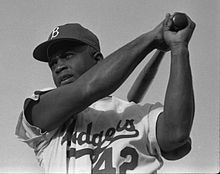 Official Site of Jackie Robinson. Archived from the original on April 15, 2009. Retrieved April 9, 2009.